Russia-backed militants conducted 22 attacks in ATO zone yesterday. “The enemy was making precision attacks upon the positions of Ukrainian troops with the Minsk-proscribed weapons – 152-mm artillery and mortars of various calibers. In Novotroitske area a serviceman of Ukraine’s National Guard tripped an unknown explosive device. The casualty was promptly taken to a hospital. He is in grave condition,” said Ukrainian Ministry of Defense spokesman on ATO Colonel Andriy Lysenko at a press-briefing at Ukraine Crisis Media Center. In Luhansk sector, Russian proxies made 11 precision attacks over the last day. They attacked Luhanske area six times, using 82-mm mortars to fire a total of 96 rounds in three cases. Additionally, militants used grenade launchers, machine guns, and small arms. “The enemy used the same type of weapons to attack the Ukrainian troops’ positions near Krymske. In Travneve area Ukrainian troops recorded a hostile attack involving mortars and a 23-mm anti-aircraft twin-barreled autocannon. 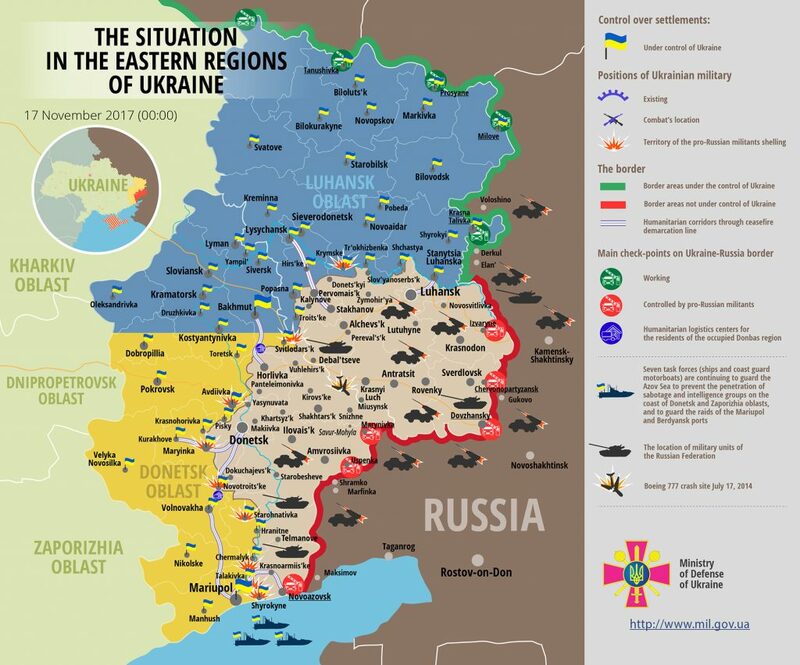 Twelve 82-mm rounds hit the Ukrainian positions,” Colonel Lysenko said. In Makarove, Russian proxies fired ten more 82-mm rounds and made a precision attack on Ukrainian troops with grenade launchers and large-caliber machine guns. In Donetsk sector, Russian proxies conducted 11 attacks over the last day. They used 152-mm artillery in Vodyane area and shelled Ukrainian positions in Pavlopil twice with 120-mm mortars. Militants fired ten more 120-mm mortar rounds near Shyrokyne. “Additionally, the above positions of Ukrainian troops, as well as the positions near Taramchuk, Maryinka, Avdiivka, Novotroitske, and Starohnativka, came under hostile fire of grenade launchers of various types, large-caliber machine guns, and small arms,” Colonel Lysenko added. Note: for the purposes of reporting, part of ATO zone previously referred to as Mariupol sector was merged with Donetsk sector. Report on the military developments as of November 16 is available here. Interactive data on the shelling: chronology shelling chart and the interactive map.